Giulia Iezzi first appears at Fairport Harbor, Lake County, Ohio, about 1915. Giulia Iezzi, her husband, Giuseppe Caruso, and son, Angelo, moved from Pennsylvania. In America, Giulia Iezzi was known Julia Caruso, then after she remarried, Julia Evangelista. Giulia Iezzi, daughter of Nicola Iezzi and Maria Serano, was born on Tuesday, June 14, 1892, at Chieti, Italy. Giulia married Giuseppe Caruso at Italy. After the death of her husband, Giulia married second, Camillo Evangelista, son of Domenico Evangelista and Elisabetta Susi, on May 25, 1920, at St. Mary Catholic Church, Painesville, Lake County, Ohio. 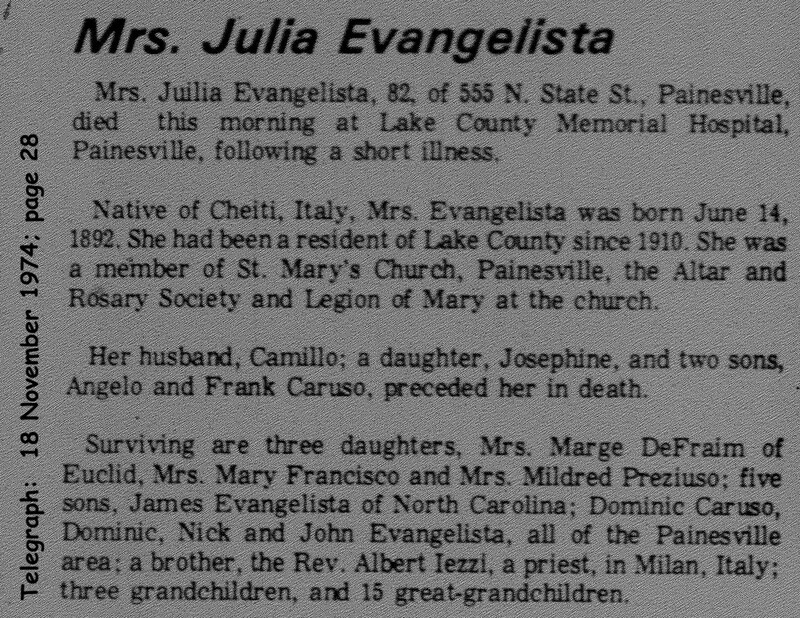 Giulia died on November 18, 1974, at Lake County Memorial Hospital, Painesville, Lake County, Ohio, at age 82. Her body was interred at Riverside Cemetery at Painesville, Lake County, Ohio. Giulia Iezzi, age 21, immigrated to the United States on September 16, 1913, at the Port of Boston. She was probably travelling to Pennsylvania to join her husband Giuseppe Caruso. Giulia’s first husband, Giusppe Caruso, died in 1918, at age 28, of influenza. She was a widow with four children under age 5. Her second husband, Camillo Evangelista, also preceded her in death in 1968. Giulia Evangelista became a citizen of the United States in 1944. Giulia resided at 734 North St. Clair Street, Fairport Harbor, Lake County, Ohio, when she was naturalized. At the time of death, Giulia resided at 555 North State Street, Painesville, Lake County, Ohio. 1. Angelo A. Caruso was born in 1914, at Pennsylvania. Angelo died in 1960. His body was interred at Riverside Cemetery at Painesville, Lake County, Ohio. 2. Frank Caruso was born on April 14, 1916. Frank died on November 4, 1965, at age 49. His body was interred at Riverside Cemetery at Painesville, Lake County, Ohio. 3. Dominic A. Caruso was born on June 14, 1917, at Fairport Harbor, Lake County, Ohio. He married Elizabeth Nasca, daughter of Giuseppe Nasca and Rosaria Panzarella, about 1939. Dominic died on August 22, 2007, at at his home, Painesville, Lake County, Ohio, at age 90. His body was interred at Riverside Cemetery at Painesville, Lake County, Ohio. 4. Josephine Caruso was born in November, 1918, at Ohio. Josephine died in May, 1920, at age 19 months. Her body was interred at Saint Mary Cemetery at Painesville Township, Lake County, Ohio. 1. Mary Evangelista was born on Saturday, August 14, 1920, at Ohio. Mary married Henry J. Francisco in 1940. Mary died on January 31, 1990, at age 69. Her body was interred at Riverside Cemetery at Painesville, Lake County, Ohio. 2. Dominic N. Evangelista was born in 1923. Dominic died in 1998. His body was interred at Riverside Cemetery at Painesville, Lake County, Ohio. 3. Mildred A. Evangelista Preziuso was born on Tuesday August 19, 1924, at Fairport Harbor, Lake County, Ohio. Mildred died on May 3, 2004, at her home, Painesville, Lake County, Ohio, at age 79. 4. Nicholas H. Evangelista was born in 1927 at Ohio. 5. James Evangelista was born on Saturday, August 16, 1930. 6. John O. Evangelista was born on Wednesday, June 27, 1934. John died on August 16, 1977, at age 43. His body was interred at Riverside Cemetery at Painesville, Lake County, Ohio. 7. Margaret Evangelista DeFrain was born in February, 1938.